Are you looking for Granite Countertops Tampa Bay? Accidental damage is one of the leading causes for replacing countertops, whether it be broken or cracked stone, or flood damage. This week, we visited a home that desperately needed their kitchen countertops replaced after an accident damaged the existing countertops. An accident left the Downing family in Tampa without a 3-foot chunk of granite on their high bar, after a decorative column came crashing down on the countertops. The column wasn’t anchored to the wall, and a friend accidentally bumped into the column. Unfortunately, the color the homeowners originally had previously installed in their kitchen was discontinued, so replacing just the broken piece was a tough fix, resulting in all new kitchen tops. The homeowners came to International Granite and Stone looking to have their broken countertop situation fixed. The customers had used IGS in the past for their bathroom projects and immediately scheduled an In-Home Consultation with Designer Jessica A. Jessica was able to help the couple find a similar type of Granite that would complement their interior without fail. After their In-Home Consultation, and a walkthrough of our Natural Stone Warehouse in Tampa, the homeowners chose Typhoon Taupe Granite. “I loved the color we had, but the new color looks terrific and I like it better. Everyone was extremely professional in helping us rectify the situation.” Mrs. Downing said. The homeowners decided to use an upgraded Ogee edge in the kitchen, after using it in their bathroom to their liking. An Ogee Edge is one of the more popular edge options for traditionally styled kitchens, with a gorgeous concaving rounded arch. While replacing the high-bar countertop, the couple opted to widen the piece, to allow for more room to spread out while sitting at the bar top. In addition to the Kitchen counters, the Downing family also opted to accent their fireplace with the Typhoon Taupe Granite, using it to create a stunning visual appearance in their Living Room. They also extended the Mantle and made surface space next to the fireplace. At International Granite & Stone, Satisfying our Customers is key. We want you to love your home renovation project as well as your new custom countertops. For 16 years, we’ve worked tirelessly to establish a loyal client base in the Tampa Bay area. What is Typhoon Taupe Granite? Typhoon Taupe is a beige-brown granite color which can also feature whites and dark browns as well. This color is known for its gorgeous waving movement. Typhoon Taupe Granite is sourced from India. This granite color pairs well with many different cabinets colors because of its neutral coloring. Granite is made under the Earth, compressed with heat and pressure to form rock hard granite chunks, that are then sliced into slabs for countertops. Typhoon Taupe is a universal beige brown color, that will never go out of style. With an In-Home Appointment and Jessica A.’s Help, the McMurray’s Chose Typhoon Taupe Granite, for Its Durability and Style. Typhoon Taupe Is a Granite Stone color. The Granite is Quarried and Manufactured out Of India. Light Beige Colors Are Preferred to Customers. 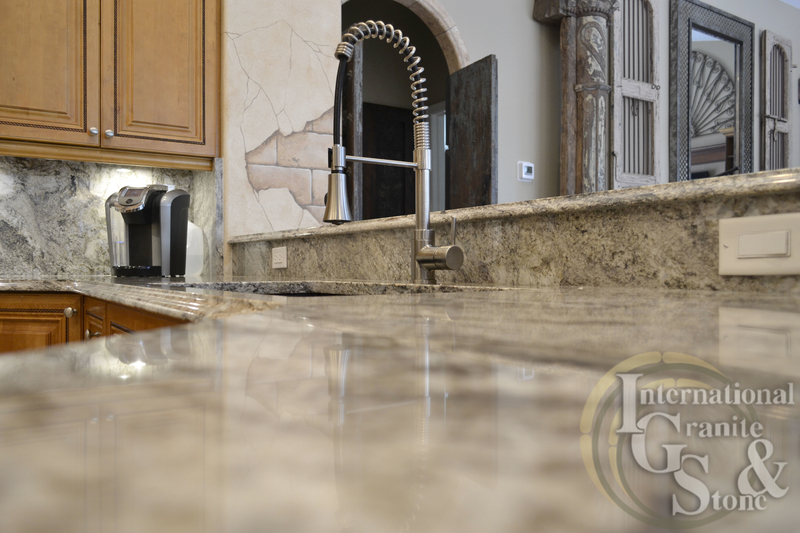 Granite does, however, need to be sealed, to block out stains, excess moisture, and damaging liquids. We recommend resealing your Granite Countertops once a year. Buy with Confidence, we have over 16 years of Fabricating and Installing Granite, Quartz, Marble, Soapstone, Onyx, and more in Kitchens and Bathrooms across the State of Florida.